I was a pretty good Doom player back in the day, but Final Doom broke me. It was a semi-sequel to Doom 2, sanctioned but not developed by id Software, consisting of two separate, 32-level episodes: Evilution, and The Plutonia Experiment. They were hard—really hard—and after three solid years of playing Doom like a fiend, I managed to beat Evilution but just couldn't power my way through Plutonia. I've learned to live with that failure, but watching Zero Master speedrun the whole thing, on a single life, at Nightmare difficulty, I feel a certain inadequacy, too. I was good, sure, but I wasn't this good. "It's now been 19 years since Final Doom was released, no one has ever attempted to do a single segment run of it on Nightmare difficulty before without using tools due to the difficulty," Zero Master explained on YouTube. "Over those 19 years there have been a lot of discoveries on how to sequence break the game. Some of the tricks used in this run are glides, rocket jumps, keygrabs, arch vile jumps and a lot of trigger skips. Without many of these tricks it would be near impossible to achieve this." One of those tricks is the "suicide exit," in which he intentionally kills himself to quickly exit a level. Under the internationally recognized Rules of the Speedrun, first codified into Bavarian law in 1487 (or so I've heard), this doesn't actually count as a death—which would invalidate the run—because the game continues uninterrupted, with the player starting the next level at full health. The total run took around 45 minutes, and it's really quite a thing to watch. 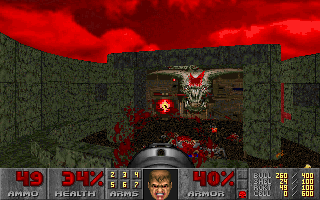 And to listen to, too; I'd forgotten just how much screaming and growling there is in Doom. Kotaku has a good breakdown of a few of the more exotic tricks used in the run, including rocket-jumping, which I didn't even know could be done in Doom—and thus my feeling of inadequacy grows just a little bit stronger.